Mr. Beamis is not “an efficient member of [the] organization”. His superior reprimands him for being “a reader”, a quality unappealing in an employee. Beamis’ ritual of scanning through texts at work is a direct result of the autocratic rule of his wife who refuses to let him read, rejecting the custom as “sacrificing the art of conversation”. Sterling crafts for us a situation where the society of a man rejects his hermetic habit of books. Albeit, this is not a Farhenteit-451 construction in which books are considered completely deplorable and to be done away with by force. While the libraries still stands and the texts are still available, it seems that the forces in Mr. Breamis’ world, the company he keeps, prevent him from his indulgence. Mr. Beamis sneaks away while at work to read within a bank vault, inadvertently functioning for our protagonist as a bomb shelter. In this appears a perfect juncture to insert an apocalypse, a cataclysm by hydrogen bomb. 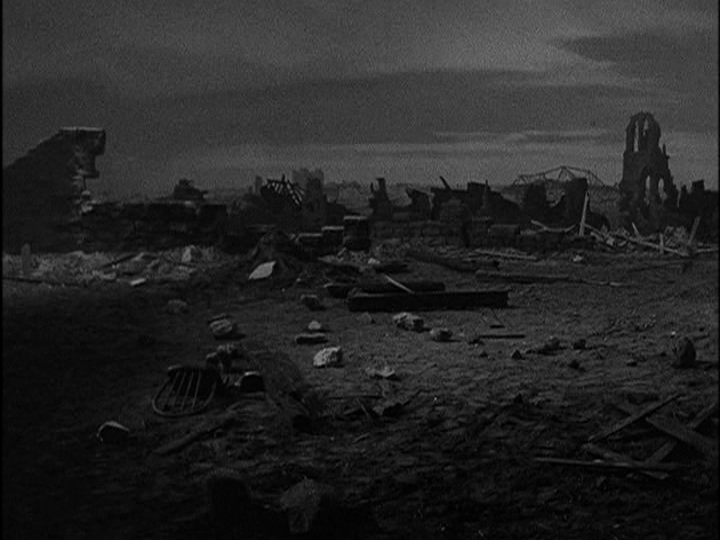 It seems impossible for much of the television and movies produced during this time (late 1950’s) to not address world war fears and the development of nuclear armaments. This particular episode is really most interesting for it’s presentation of the post-apocalyptic moment, after the breaking of Beamis’ pocket watch, which cracked due to the bombing, into a new mode of time. The destroyed innards of the bank serve to symbolize the ceasing of a world created upon a very specific system of values, a collapse of civilization. The destruction of a structure created for the purpose of storing and dispensing forms of capital, is the initial indicator of the end of the world. A tape recorder reels out the speech dictated by the head banker to his secretary for the Thursday night banquet (“a constant remembrance that the bank, like a political office, is a public trust”) self-destructs as the sole survivor first moves with timid steps through the remains of a past-life vanished. The “battered monuments” of infrastructure, (a pay-phone, a neighborhood bar, a mailbox) help to confirm the mysterious extinction of Beamis’ former environment. On a side note, one of the cinematography effects I appreciate about the scenes portrayed of a world-burned-out are the obvious markings of the shot taking place on a set, like the weird way the horizon looks and how the sky appears totally motionless. 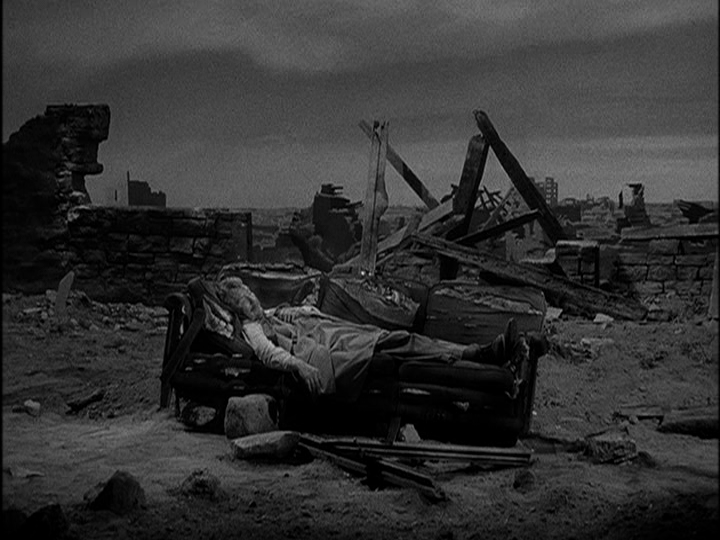 There is something exciting about the idea of imagining the world destroyed and then constructing such a vision, “a smashed landscape”, on a closed set in warehouse in southern California. 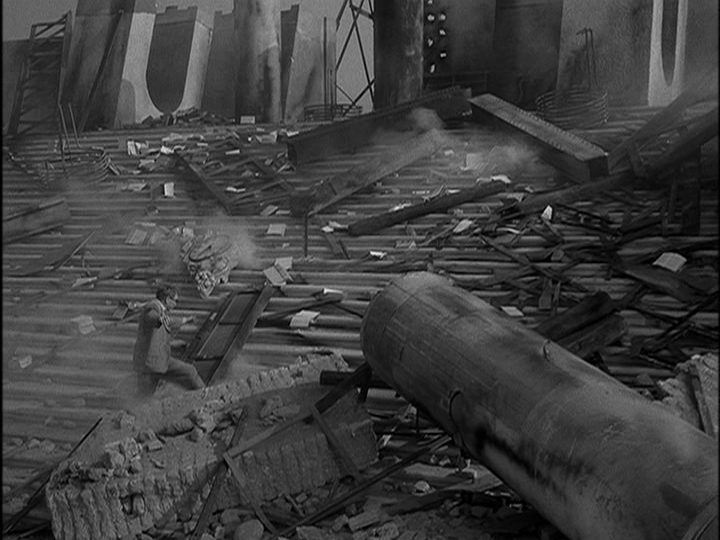 There is a moment when Beamis almost succumbs to his loneliness, finding a small handgun amongst the rubble. At the moment when he is about to exact his own demise, a beacon of hope presents itself—a fallen pillar of the public library. This is the most beautiful portrait of destruction, Beamis excitedly running up the debris-ridden stairs littered with novels by famous authors. These works appear to be his saving grace, his reason to live. Of course, it seems rather obvious from the beginning that this bespectacled man with lenses thick like magnifying glass will suffer some strange fate related to his sight. Indeed, upon his greatest moment of joy, his exuberant embrace of time unconstrained, he leans over and his glasses fall from his face, smashing to pieces on the ground. It’s fair to say that this is a morose story. Without doubt, it would be unlikely for Beamis’ fate to not become somehow twisted, for everyone else’s apocalypse to become his own utopia. Still, we are never led to view Beamis as a morally corrupt man deserving a harsh sentence. Instead, we witness a man saved from death twice only to suffer a grueling sentence, to be stripped of his vision and, ultimately, his will to live by Sterling’s exploitation of a frailty. 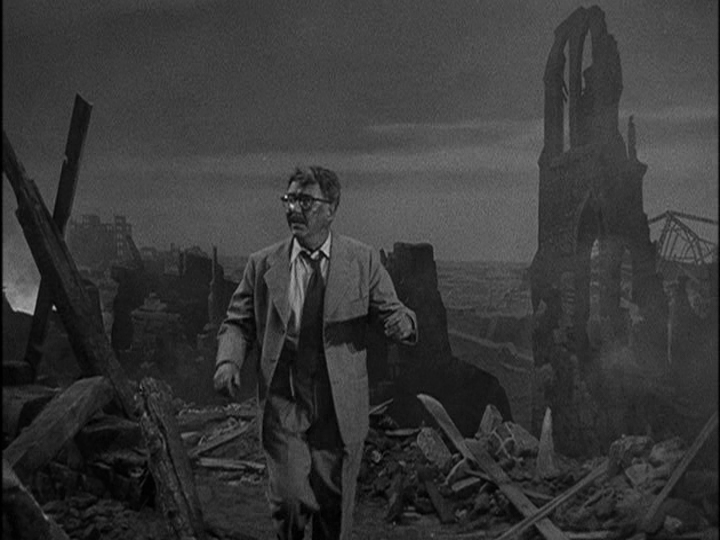 This episode contains the classic sort of irony characteristic of Rod Sterling and The Twilight Zone, the appearance of a situation that reveals itself as not possibly being what it seems. The viewer can understand at an early point that the plot will somehow manifest a shifted version of reality by the end, the last moments destined to make sense of the scenes prior and generate an end with a resemblance of shrouded explanation. 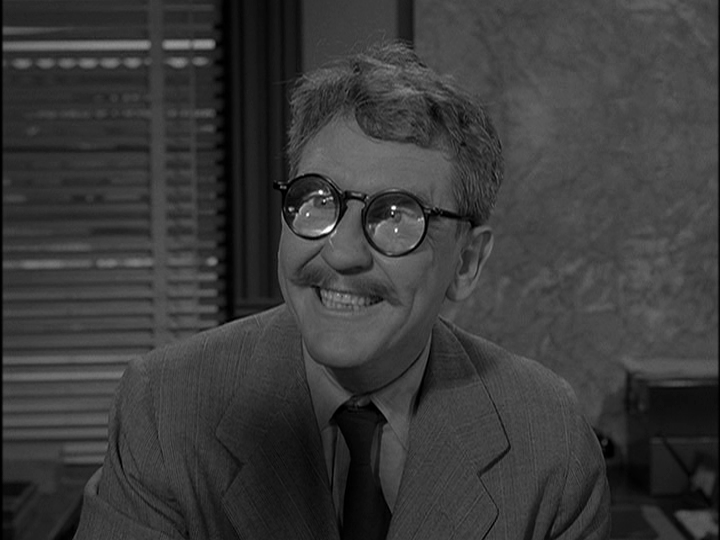 What is commendable about The Twilight Zone is it’s unwillingness to edify, the series reluctance to provide unprecedented glimmers of optimism or explicit morals. The whole premise of Sterling’s creation is to depict an altered dimension more-often-than-not with a rationale not based in our own immediate realities. So nice about this approach to storytelling is the expressive freedom present in creating a world where things are inexplicable and left with an aura of the unknown. This allows for the tales to present ideas not constricted by the rules of reason, or as Sterling would say, in The Twilight Zone. 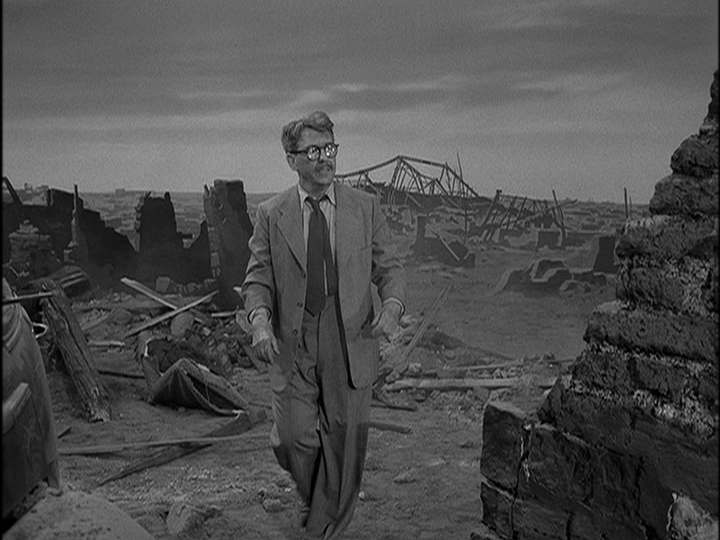 This entry was posted in Uncategorized and tagged apocalyptic imagery, Rod Sterling, Science Fiction, smash the state, the apocalypse, the end of the world, The Twilight Zone, Time Enough at Last. Bookmark the permalink.